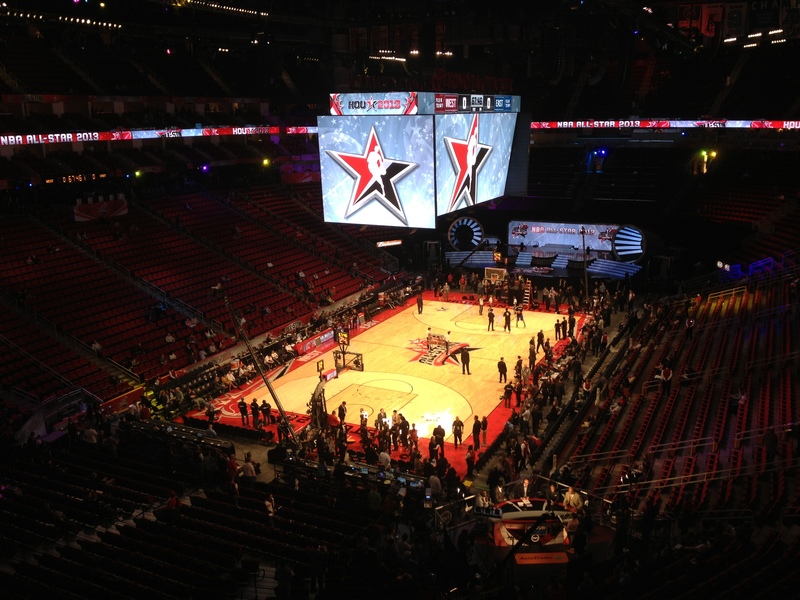 Last week’s release of the NBA’s 2014-15 season schedule marks the return of the non-conference posts. Maybe we’ll find something that gives one conference a scheduling edge over the other in their non-conference matchups. For the East, that would be nice. As a reminder, 450 non-conference games are played each season, basically taking the number of teams (30) divided by those in each conference (15). The matchups last season were historic in several ways, one being that the West outscored the East by 4.09 points per game, the highest ever point differential in the last 17 seasons, according to NBA.com. The 2014 West nearly finished with the highest winning percentage in non-conference play, but fell just short of the mark set in 2004 at 63.33 percent. It’s probably obvious, but the 450 non-conference games next season are not scheduled at a consistent frequency over the season nor do they all take place within designated weeks. Below is a chart of how many of these games take place in each of the 25 weeks. 19 of those 25 have anywhere from 14-29 non-conference games and the ones that fall below that range are opening week, the week just before and after the all-star break, and the last three weeks of the season. On the other end, weeks 5&6 (11/24-12/7), 13&14 (1/19-2/1), and 20&21 (3/9-3/22) combine to take up over a third of the non-conference games. Those two-week stretches feature 50, 51, and 56 games, respectively. And though each team has 15 home and road non-conference games, they don’t happen equally either. 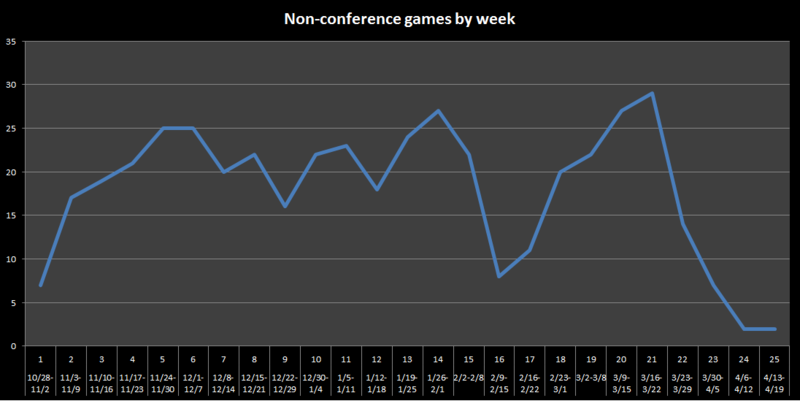 Below is a chart looking at how many more home games each conference plays versus the other each week. 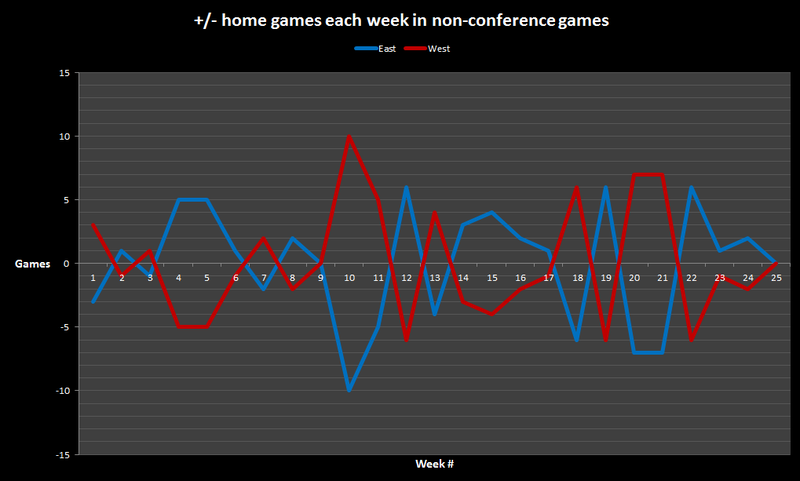 For example, on the first week (10/28-11/2) the West has five home non-conference games versus two for the East, which amounts to +3 in the chart. The East will have more home games early on, but it will catch up to them as we head into 2015 when the West will have 30 of the 45 games from 12/30 to 1/11 at home. From 1/26 to 2/22, the East will have 10 more home games than the West, but then the West hits another home-heavy stretch from 3/9 to 3/22. The advantage of playing games on more rest than an opponent goes to the East, 108 to the West’s 104, but the West holds arguably the most important rest advantage: Games with rest vs squads on back-to-backs, 69 games to 65 but also a 60 to 49 edge in games at home vs squads on a back-to-back. An advantage for the East is having six more games where they’ll have more rest vs opponents coming off a one-day break, best when an opponent is in the middle of a stretch of four games in five nights or three in four. Of course, not all back-to-backs are equal. A back-to-back combo of Philadelphia and Boston is less intimidating than 2/3 of the Texas Triangle. Then again, the Knicks went 2-1 through the Spurs, Rockets, and Mavericks. Injuries and mid-season trades also happen, though the latter not nearly as often as in the past. Predictions for teams and conferences is pointless to me, but I still see a top-5 point differential for the West with the reason as simple as the West remaining lo-o-o-oaded. That prediction isn’t as bold as saying the West will record their best ever winning percentage versus the East, but like last year a ton would have to go wrong for that to have a chance of happening. For the sake of a great season and competitive balance, hopefully Derrick Rose and the Bulls stay healthy, Toronto picks up where they left off since trading Rudy Gay, Chris Bosh returns to a strong #1 option, Cleveland has a hell of a year with LeBron James, Kevin Love, and Kyrie Irving, and the middle of the East wins a few more games than last season. But we’re still over two months away from the regular season, which I struggle to accept. First hopeful thing comes first: Hopefully this off-season doesn’t last forever.